If you present face to face as part of your job or as part of your business, either one on one or to thousands, knowing the techniques and skills of some of the best presenters in the world could take your presenting to a whole new level. Being able to present to other people is a skill like any other. There are techniques and methods that will dramatically increase the effectiveness of any presenter. As a professional keynote speaker, Andrew Griffiths appreciates the benefits of being trained by other experienced presenters – it is a short cut to learning the tricks of the trades that can take you from mediocre to exceptional. 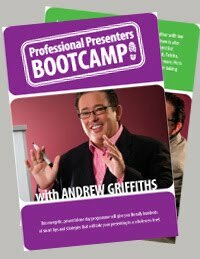 Andrew will be running his Professional Presenters Bootcamp in Cairns and Townsville in November. It's a one day hands-on workshop that is interactive and loads of fun. "You can read some testimonials from other people who have attended my Professional Presenters Bootcamp in the past, "Andrew Griffiths says. "Regardless of what type of presenting you do, I have no doubt that my Professional Presenters Bootcamp will give you a pile of new skills and practical tips that will take your presenting to a whole new level. In fact I guarantee it!" Robert Rutten, of Cairns web design company Ruttentech, says he's been speaking publicly for some time. "The programme opened his eyes to a whole new level of professionalism and skills development that I didn’t even know existed. Great stuff – and fun too,” Rob Rutten said. “The Bootcamp was an excellent experience in controlling nerves and being well-rehearsed and well-prepared," says Nicky Jurd of Precedence. "I especially enjoyed Andrew’s death by powerpoint presentation." Only 25 people are accepted for each workshop, which makes for a more beneficial experience. this man is awesome if you are able to attend GO! !